Television, since its inception in the early twenties, has gone through a plethora of changes. From the big curvy boxes to the thin and flat LCDs, the attention-seeking living room device still stays one of the most popular gadgets around. While watching the television whilst sprawled on a sofa has been the ultimate Sunday experience, the need for mobility is slowly changing this scenario. TV, these days, has become a bit more mobile, thus catering to the needs of people who are always on the go. Our very own Android too hasn’t been that immune from the mobility boom as it has some amazing Internet TV apps to boast of. So, to help you choose the best of the lot, here we are with another article outlining only the essential Internet TV apps for Android. Though basically a media platform, Plex does come in handy if you’re looking for a comfortable way to get access to Internet television. 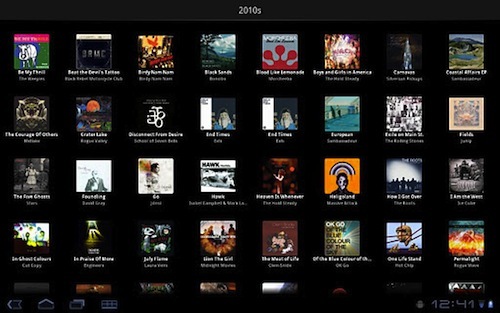 With a beautifully organized interface, Plex works well in unison with the Plex media server. 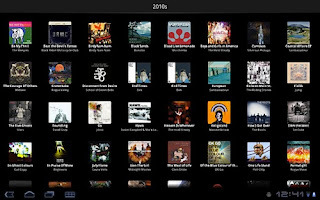 Apart from letting you browse, play, and manage your media from your Droid, Plex also gives you access to 200 of the hottest Internet TV channels. 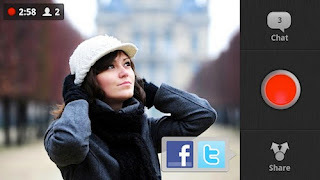 You can get the best entertainment from sources like CNET, YouTube, Vimeo, Revison3 and more. Working seamlessly across Windows, Mac, Roku, Android and a bunch of other devices (including TVs), Plex serves as a great one-stop entertainment solution for Internet-TV junkies. Crackle is a popular entertainment app that lets you watch full-length Hollywood movies and TV shows for free, right from your Android device. The app provides full-length uncut TV shows, the list of which includes an impressive number of classics like Seinfeld, Samurai-X, The Three Stooges, and more. 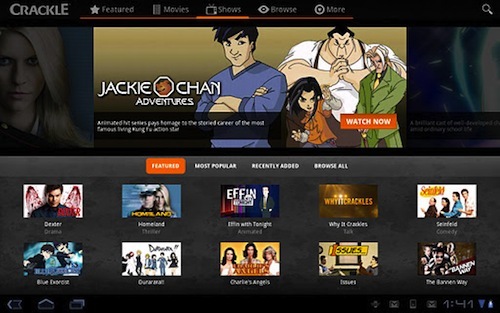 With high-quality streaming over Wi-Fi, 3G, and 4G, Crackle also allows you to watch hundreds of full-length movies. Though limited to US, UK, Australia, and Canada, Crackle does prove to be a great source for catching up with some great television entertainment. Folks in the UK must be well familiar with this application. Official app of the largest broadcaster in the world, this free but region-limited application lets you watch and listen to over 400 hours of BBC programs. You can listen to live radio, watch live TV, and browse through a schedule of upcoming shows. Though Flash-based, the app is very popular in the United Kingdom. This is a nifty little application that lets you stream TV content from over 100 online TV channels for free. The app, which uses ffmpeg and libmms, supports a wide variety of formats including rmvb, rm, avi, mpeg, flv, and more. Revision3 is a popular Internet TV network, mostly known for shows like Tekzilla, Diggnation and App Judgement. This free app brings the whole Revision3 experience into a nice little Android application letting you watch all the popular shows like Tekzilla right from your Android device. 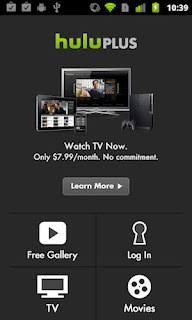 Hulu Plus for Android brings the highly popular Hulu experience to your mobile phone. 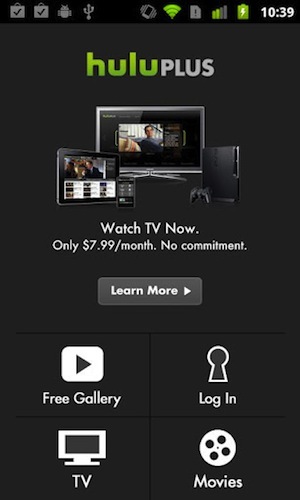 Once installed, Hulu Plus members can stream thousands of episodes from hundreds of current and classic TV shows. 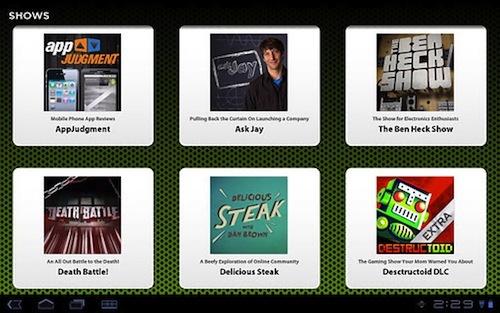 Though mainly for Hulu Plus subscribers, the app does provide a lot of free episodes for non-subscribers to sample out. Users can also opt-in for a one-week free trial if they want to. Once the trial ends, the service costs about $8 a month. If you’re a fan of Justin.tv (don’t worry, it’s not another Justin Bieber fan site), then this app might be something you should download right away. The free application lets you broadcast live content to the web over Wi-Fi and 3G. What’s more, you can also chat with your viewers while doing the show.